How many bowling games do you think have been made? I looked around and via the Giant Bomb wiki it seems like there have been almost 100 bowling games or games that include bowling mini games. Which seems like a lot. How many different versions of bowling games does the world need? It seems like the first bowling video game released was simply called Bowling. It was released in 1977 and was a built in-game playable on the RCA Studio II. The visuals could be described as simple. PBA Bowling in 1982 wasn’t for amateurs. This was professional bowling. This was one of the first bowling games to use the PBA, Professional Bowlers Association, licence. This is like the Madden of bowling games. 3-D Bowling isn’t really 3D at all. 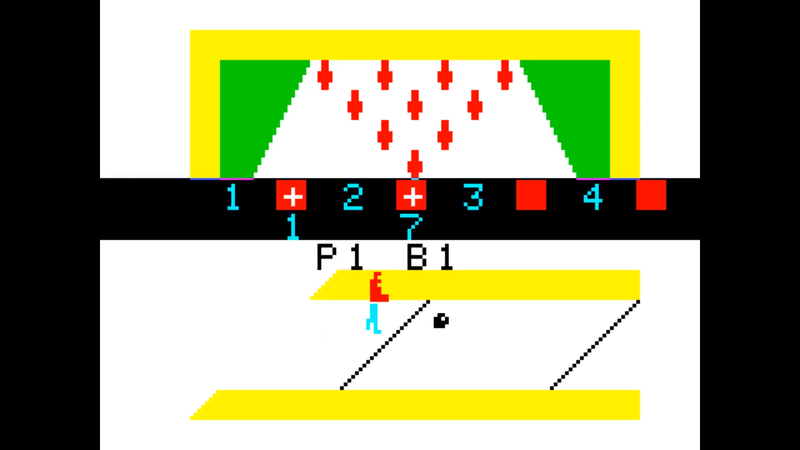 Instead this bowling game uses similar visuals to PBA Bowling, but now players can see both the pins and the player at the same time. This doesn’t seem like a big deal today and I imagine it wasn’t a big deal back then. 3-D Bowling was released on the Emerson Arcadia 2001 which was a console that only lasted 18 months and only had 35 games released for it. The '80s was filled with a lot of boring-looking bowling games. The '90s changed this trend and we started getting some more exciting bowling games. 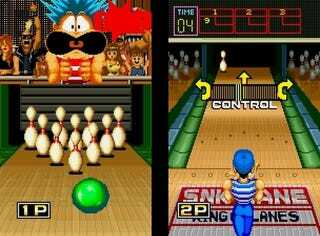 Like League Bowling from SNK, which was released in 1991. This bowling game allowed two players to bowl at the same time and featured colourful and fun visuals. Here’s something odd: there were two bowling games released for Nintendo’s Virtual Boy console. In total the Virtual Boy only had 22 games ever released for it, which means bowling games make up 9 per cent of the entire library. On an unrelated note, the Virtual Boy was a massive failure and was quickly discontinued. That probably wasn’t because 9 per cent of games released for it were bowling related. Probably. One of the earliest attempts at making a truly polygonal 3D bowling game was released in 1998. AMF Pro Bowl 3D doesn’t seem to have been a popular game. On all of YouTube I can only find one gameplay video of the game, recorded off a screen. It doesn’t look very good, the game I mean. The video is fine and honestly I’m thankful that at least one person on Earth decided to record some footage of AMF Pro Bowl 3D. Thanks, Oshy. Released the same year as AMF Pro Bowl 3D, Milo’s Astro Lanes was an N64 game that took bowling into the 22nd century. Finally, bowling in space. The game featured aliens, exotic planets and let you bowl near a volcano. Though bowling purists might not like the power-ups placed on the lane. Or the fact that you don’t seem to be using a regulation ball, but instead a sphere of electrical energy. The future is weird. The early 2000s was a great time for fans of licensed bowling games. The Animanics got a bowling game. The Simpsons got a bowling game. There was a Monster’s Inc bowling game. Even The Flintstones got in on the action, releasing The Flintstones: Bedrock Bowling in July 2000, over 30 years after the series was released. 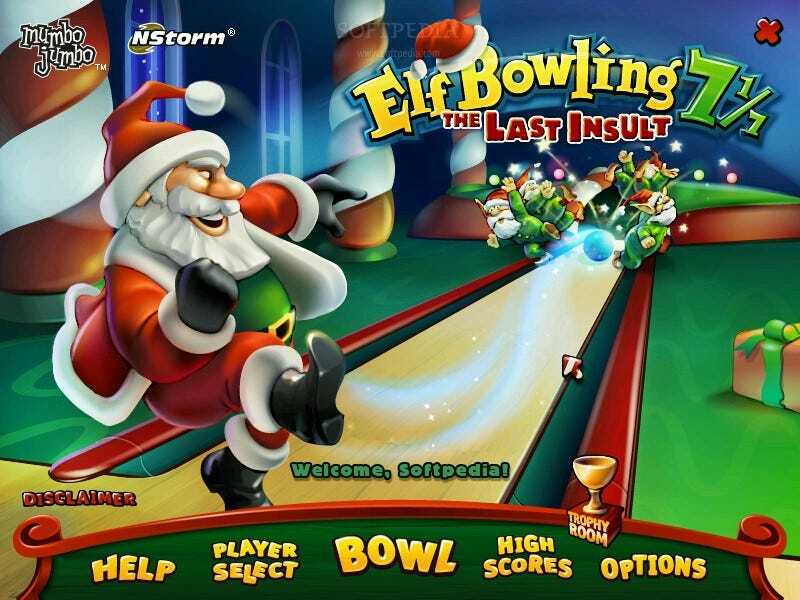 Elf Bowling would jump from games to big screen in 2007 with the release of a movie based on the bowling series. Elf Bowling The Movie: The Great North Pole Elf Strike was not very successful. Of course the Wii saw a lot of bowling games released on the console. 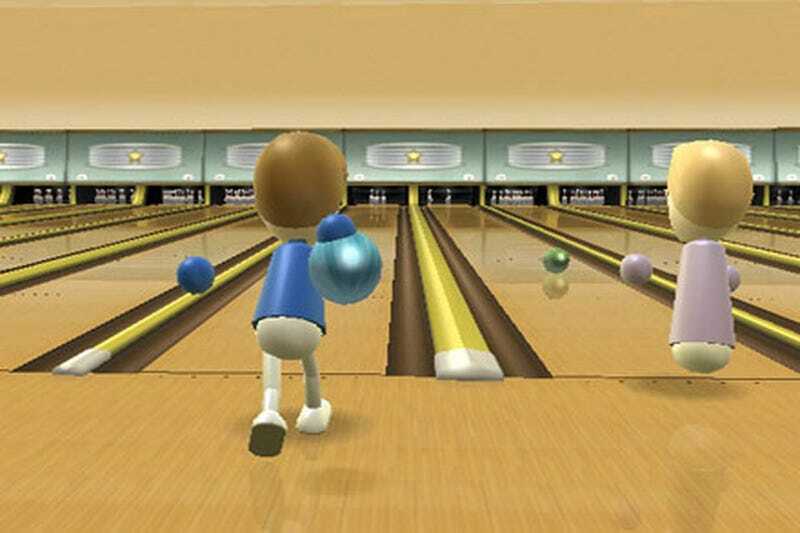 After how successful Wii Sports was, many tried to bring bowling to the motion-controlled console. It makes sense, bowling is like the perfect sport for the Wii. I remember my grandparents bought a Wii just so they could play Wii Sports and the game they played the most was easily bowling. You don’t really have to teach people how to play it. Can your throw a bowling ball? Congratulations. You already know everything you need to know to play bowling in Wii Sports. The last few years has seen a bunch of games include bowling as a mini-game, like GTA IV’s infamous bowling mini-game. 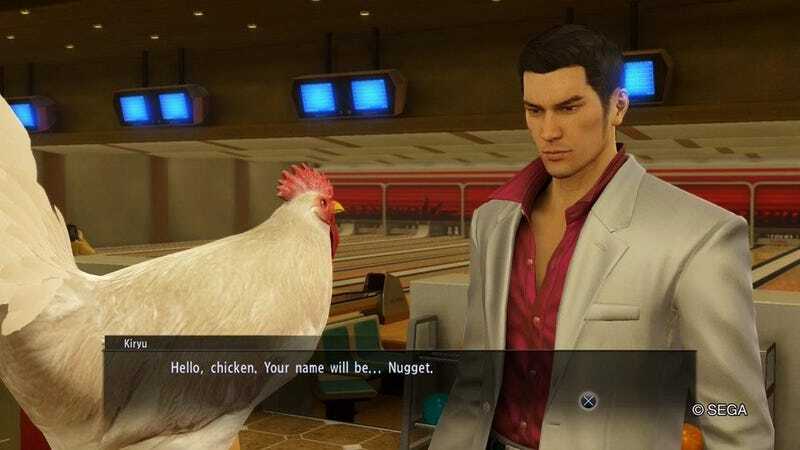 Yakuza 0 also has bowling in it, though their bowling alley will award you a chicken if you do well enough, which is honestly a great innovation in bowling game history. Sadly, while bowling has appeared in newer games we haven’t received many dedicated bowling games for PS4 or Xbox One. These days, bowling games are popular on mobile devices and maybe that is where all the bowling games will live from now on. Bowling and golf games occupy similar parts of my brain. I don’t really enjoy playing either in real life, but I’m always down for some digital pins and balls.